Slide-Lok, the nation's leading manufacturer of garage cabinets and garage storage systems and supplier of the industry leading garage floor coating system, increases brand awareness with introduction of nationwide vehicle branding effort. 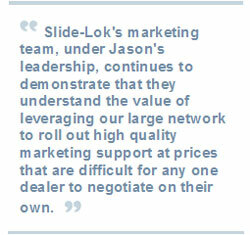 Phoenix, AZ - May 16, 2007 - For Slide-Lok, it's always been about supporting their dealers for the benefit of the customer. By providing top quality garage cabinets, garage storage, garage flooring, and closet systems to the customer through their well trained and well supported North American dealer network, Slide-Lok has found the formula for success. Now, Slide-Lok announces the latest in a long line of dealer support services aimed at helping its dealer network increase brand awareness and attract customers.